"Reynolds has made my dream come true…" Hold on! The year isn't over yet! There's still a few contenders waiting to premiere. 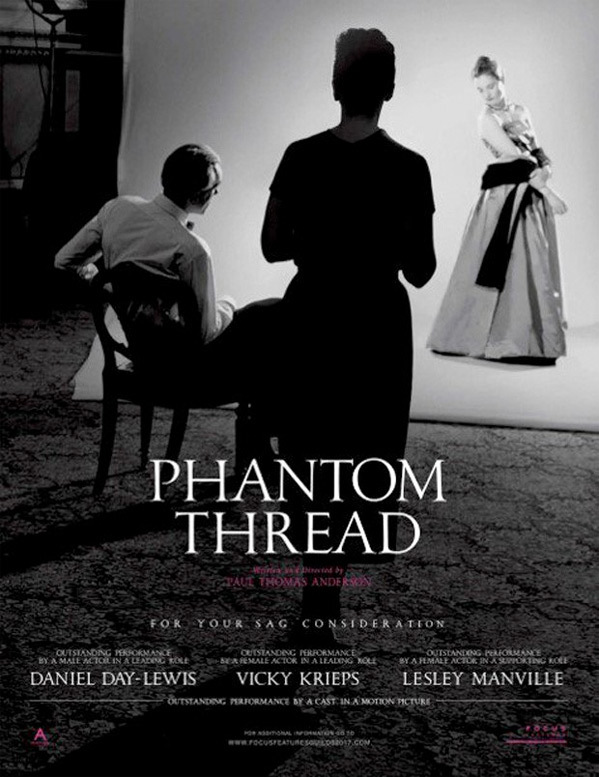 Focus Features has debuted a new "sneak preview" trailer Paul Thomas Anderson's latest film, Phantom Thread, featuring details on sneak preview screenings happening in New York and L.A. Don't forget, PTA ran this kind of preview for The Master a few years ago as well. This is supposedly the final film for acclaimed actor Daniel Day-Lewis, who is retiring from acting (for now). Set in the 1950s in London, the sensual story is about renowned dressmaker named Reynolds Woodcock, as played by Day-Lewis, whose "carefully tailored life" is disrupted by love - as you can watch in this new trailer. The cast includes Lesley Manville, Vicky Krieps, Camilla Rutherford, and Jane Perry. The movie "paints an illuminating portrait both of an artist on a creative journey, and the women who keep his world running." This looks fantastic, but I wouldn't expect anything less from PTA - right? Can't wait to see the film myself. You can still watch the first official trailer for PTA's Phantom Thread here, to see more footage from this. Set in the glamour of 1950's post-war London, renowned dressmaker Reynolds Woodcock (Daniel Day-Lewis) and his sister Cyril (Lesley Manville) are at the center of British fashion, dressing royalty, movie stars, heiresses, socialites, debutants and dames with the distinct style of The House of Woodcock. Women come and go through Woodcock’s life, providing the bachelor with inspiration and companionship, until he comes across a young, strong-willed woman, Alma (Vicky Krieps), who soon becomes a fixture in his life as his muse and lover. Once controlled and planned, he finds his carefully tailored life disrupted by love. Phantom Thread is written and directed by iconic filmmaker Paul Thomas Anderson, of the films Cigarettes & Coffee, Boogie Nights, Magnolia, Punch-Drunk Love, There Will Be Blood, The Master, Inherent Vice, and Junun previously. This has yet to premiere at any film festivals. Focus will release PTA's Phantom Thread in select theaters starting December 25th, Christmas Day, this year. Who's excited now?